UK DJ and producer 2tall drops an all new downtempo excursion! Most recently he collaborated with Georgia Ann Muldrow and Dudley Perkins on Beautiful Mindz and appeared on the Signal Path compilation from Hip Hop Vinyl out of Germany. 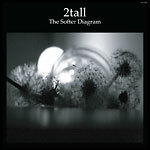 Softer is representative of the way in which he approached the production on the album, with less complicated, simplistic electronica and hip hop instrumentals. For fans of Glen Porter, DDay One and 40 Winks and limited to only 500 copies around the world!